Run for it, Charlie! Run straight home and don't stop 'til you get there! Or at least until creepy faux Slugworth steps out into your path. I'm seriously dreading the day Mike says he won't watch Willy Wonka with me anymore because of my inability to shut up when it's on. Believe me, I'm not a fan of talk-a-long movie watchers either but this film is my one exception to that rule. I've watched it no less than 150+ times in my life and I'll probably watch it again this weekend. In fact, I just realized at this very moment that Willy Wonka and the Chocolate Factory may very well be my favorite movie. Ever. It's a bold statement but one that I feel confident making. One of the most memorable things about this film is the soundtrack. The glockenspiel in "Pure Imagination" is so whimsical yet haunting - the perfect prelude to what lies ahead in the factory once they enter The Chocolate Room. This movie deserves a treat that appeals to sweets lovers of all ages, is simple to make (we don't want to cut into our viewing time) and is outrageously, unapologetically, scrumdiddlyumptiously chocolately. Fellow blogger Susan Hawkins shared this incredible recipe for her grandma's chocolate cobbler on PW's Tasty Kitchen site. Oh yes. You heard right. Chocolate cobbler. In a medium bowl, combine the flour, baking powder, salt, 3 Tablespoons of the cocoa powder and 3/4 cup of granulated sugar. You'll need the remaining cocoa and sugar later. Stir the milk, melted butter and vanilla into the flour mixture. Mix well. Pour the batter into an ungreased 8-inch baking dish. Sneak a bite in the process. In a small bowl, mix together the brown sugar and remaining 1/2 cup sugar and 4 Tablespoons cocoa. Use a spoon and sprinkle evenly over the batter. Your cobbler should look like a calming, cocoa-y beach by this point. The final step: pour the hot water all over the batter. Do not, I repeat, DO NOT stir. I'm sorry to get all bossy on you but I'm only looking out for you and your cobbler. Bake for 35-40 minutes until the center is set. In that magic heat-emitting box, the batter, the sugary layer and the hot water joined forces and the result is this gooey, chocolate-y, cakey amalgamation of awesome. 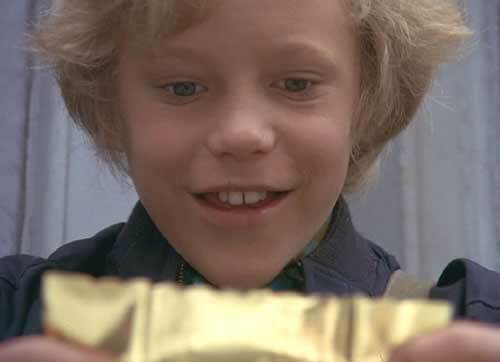 'Cause I've got a Golden Ticket...it's ours, Charlie! The cobbler pairs perfectly with vanilla ice cream, especially while it's still warm. I cut back on some of the sugar (about 1/4 cup.) I was feeling guilty about the extra beer I had after dinner. Now, before you go off to make your own chocolate cobbler, you have to solemnly swear never to hide it in the secret areas of your home to keep others from eating it for as long as you all shall live. Agreed! And, OMG, I am sooooooooo gonna make this!! This is barking mad brilliant and I am so peeved that I never thought of it!!! very cute idea.. I post songs referencing sweets, pastry ....but i never add a recipe..That is better! That movie rocks! A commercial has been using that song recently and it always makes me wish I were a kid again, so I could let my crazy imagination roll. The pill taht Violet eats makes me think of the Jetsons and how they would eat their meal in that manner. 1) That looks so yummy. 2) That's also one of my favorite movies, love love love it. Ali, I don't think there's been a single thing you've posted since you started your blog that I have said to myself, "I don't want to make that." Amazing. Denise - I couldn't believe how it turned out after reading the recipe. It ranks up there with your pistachio fudgesicles. Pammy Dawn - definitely watch it with your daughter! 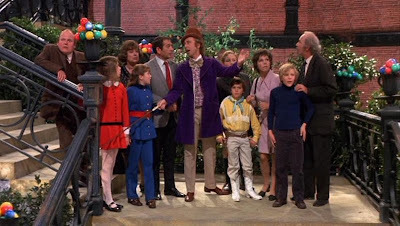 Even with the remake and all of the CGI in children's movies these days, the original Willy Wonka remains timeless. I think she'd love it. That opening scene always gets them. Margie - yes! The car commercial! It makes me feel the same way. "Roast beef and a baked potato...mmm!" "With sour cream?!" Amy - thanks lady <3 Looking forward to your next blog entry...I need a vacation. One of my favorites. Don't be afraid to use this as a "topping" for chocolate chip cookie dough ice cream. Seriously, don't. It's just dessert. Ali! You Vermicious Knid! You did it! You featured the one movie that I had hoped for. The Chocolate Cobbler is a definite do for the weekend. Thank you for a delightful tribute to one of my all-time favs. That looks ridiculously good. I'd love to try it with some vanilla ice cream and a fresh fruit sauce or something. Raspberry maybe. I'm sure it's phenomenal with just the chocolate too though. My talk-a-long movie is Spaceballs. I just can't watch it with my mouth shut. Amanda has long ago refused to ever watch it with me again. Mike - there are cobbler AND peanut butter remnants in the ice cream container. Interesting. Liam - sweet, you have a talk-a-long movie, too! I was hoping someone would share theirs. That looks amazing. I'm loving these movie posts. 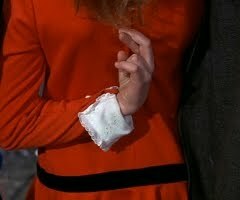 Frankly, I think Veruca Salt deserves her own dish. I think I still quote this movie at least twice a week. It's so amazing and the newer version just didn't do the original justice. Oh, and that cobbler looks like brownie batter (yum)! Thanks so much for the suggestions on Montreal. I'm getting pumped to explore a new city! Hah! I was just talking about that movie this weekend - the scene where Charlie is opening up the winning chocolate bar always gets me. Love it. I actually make this chocolate cobbler recipe all the time. It is SOOOO frikkin good and easy. Your version looks dang good too. Rick - I think you're onto something. Biting that idea for later. Taylor - I love Johnny Depp just as much as the next (or every) girl but remake couldn't hold a Slugworth's Sizzler to the original. Ms. Meanie - such a great scene. That 4-note flute melody just as he sees the first glimmer of the ticket gets me so excited. And I can't believe I'm just now discovering chocolate cobbler. My childhood would have love it.